Have you been searching high and low for a car dealership in the Round Rock area that you can trust? Look no further than Nyle Maxwell CDJR of Taylor. Our friendly sales associates will guide you through a stress-free car shopping experience full of honesty and integrity. You’ll be set up in the new Chrysler, Dodge, Jeep, RAM or used car that fits perfectly with your lifestyle. Once you’ve decided on the vehicle that’s just right for you, our auto finance specialists will take over. You’ll be in control of your monthly car payments once all of your car loan or lease options have been explained thoroughly. We will work with you to ensure you receive the lowest interest rates available in Round Rock, regardless of credit. Even when you’re back home in Round Rock, you’ll still be on our minds. Our auto repair and car parts technicians are standing by, ready to extend your vehicle’s lifespan. 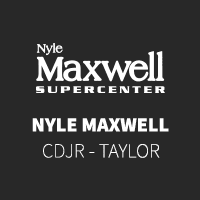 So stop by today, and experience the Nyle Maxwell CDJR of Taylor difference.